Happy Royal Francophile Friday to you! 'Uplifting and cheering for the spirit' describes your blog so exactly Shell that you should get in touch with all the major channnels about televising it when the happy wedding hoohaa has died down. And yes please, I'll have a macaron. Two. A macaron and a glass of champagne for me! After all, momentous occasions are to be celebrated. Another charming illo, Shell. And tasty looking too. 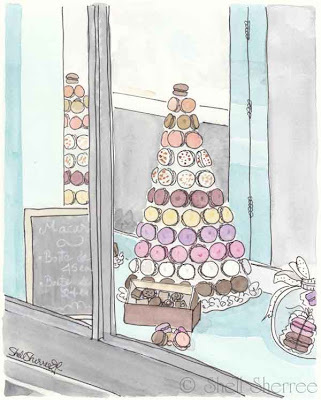 Genie ~ having heard from Virginia what a superb macaron baker you are, I suspect you could whip up a magnificent tower in record time! A perfect illustration! & I totally agree with your sentiments. Have a great weekend Miss Shell Sherree. I like a fairy tale now and then, too. Especially on Fridays. Katie ~ I'd love within munching distance of a hat like that. Thanks, dear Lily! I hope you're having a beautiful weekend. The very least I could do, Favourite Vintage Finds. Always a pleasure to help the fairytales along for you, Petrea. Alexa ~ newly minted. Heh! I'll bet the ladder to access said tower would be gilded. 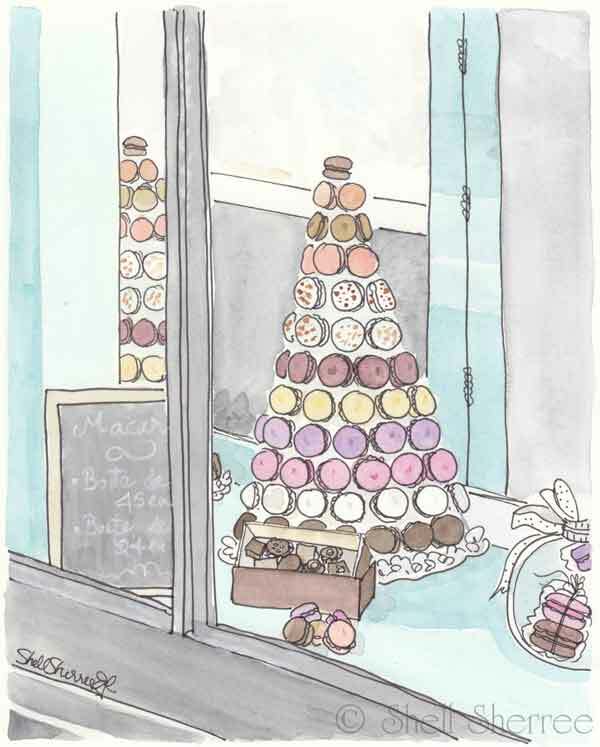 I missed the Royal Wedding Cake but I'm certain it could not have been as enticing as this tower of macarons. What a delightful confection! I can see why you were inspired by Virginia's vivid original. It looks scrumptious too. Bon week-end, Shell! Oh, I was jonesing for something sweet. Susan ~ an all-white tower with some white icing flowers filling in the gaps could have been elegant. Bon weekend to you and your fur-kids! Hiker ~ I knew that. Oh my, I think a macaron wedding cake would be parfait!!! I'm blushing over your lovely illo of my photo dear one. Merci mille fois! PS I think I 've seen reruns of the wedding about 4 times now. I'm a nut! No macaroons tho. Oh but wasn't it just wonderful. I love to see people in love and they are and were and hopefully always will be. Such an appropriate and lovely (not to mention yummy) tribute to the royal couple! Thank YOU, dear Virginia, as always! You're a romantic, aren't you. Margaret ~ keep going. They store for a week in the fridge.